Do you love a bit of thrifting? 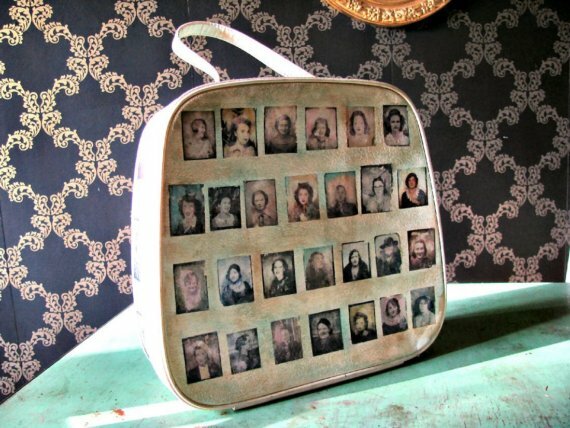 Well look no further than online store Etsy for Yasmin Bochi, a designer and art re-styler who is innovating products of yesteryear and bringing them right back into the 21st century with clever art manipulation techniques. 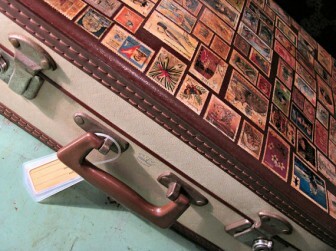 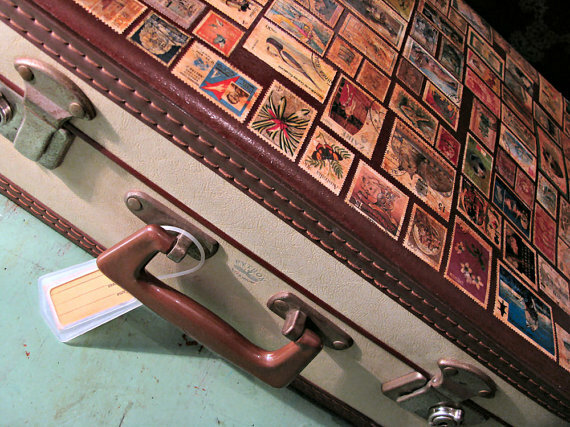 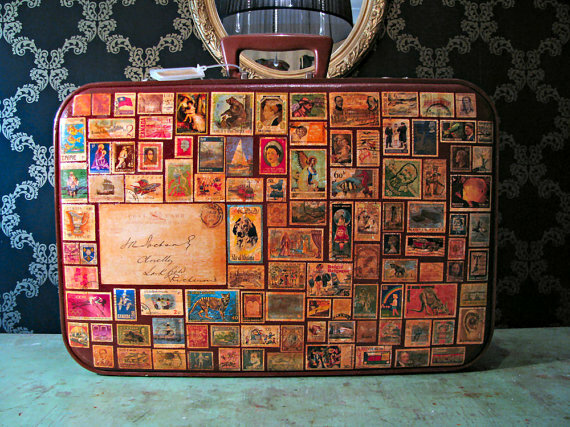 Having a bit of a penchant for vintage bags and suitcases myself, the beautiful ‘Around the World in 80 Stamps’ suitcase immediately caught my eye. This beautiful brown and cream faux leather vintage suitcase is decorated with real vintage postage stamps from around the world (Congo, Pakistan, Austria, Nigeria, Tanzania and Sweden to name a few!) 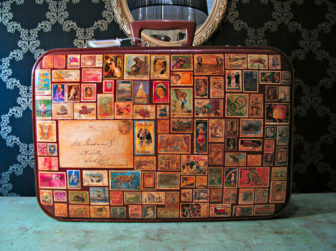 and incorporates old postcards dating back to the early 1900s on either side. 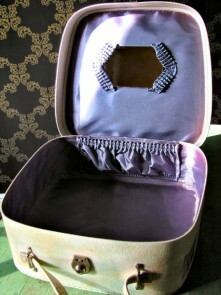 It’s the perfect hold-all for overnight trips whilst looking decadently chic with a nostalgic twist. I’m also coveting the ‘Tattoo Flower Vintage Purse’, an accessory perfect for a daytime lunch date. The snakeskin base is hand-painted in shades of green and aqua, accentuating the detail of the rich floral colours. 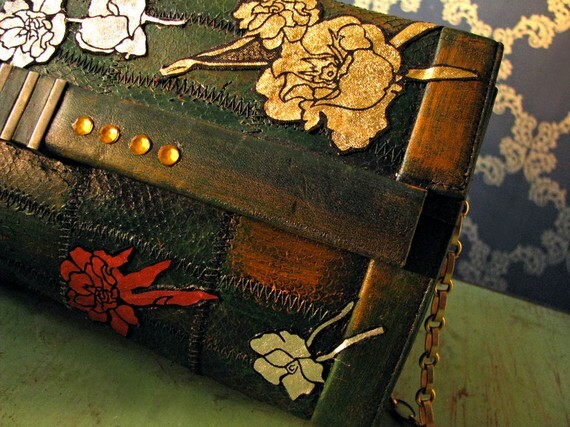 I love the wood panel detailing on the purse too that makes for an unusual design aspect to a unique creation. Speaking of treasures, how cool is this ‘Alice in Wonderland Necklace’? 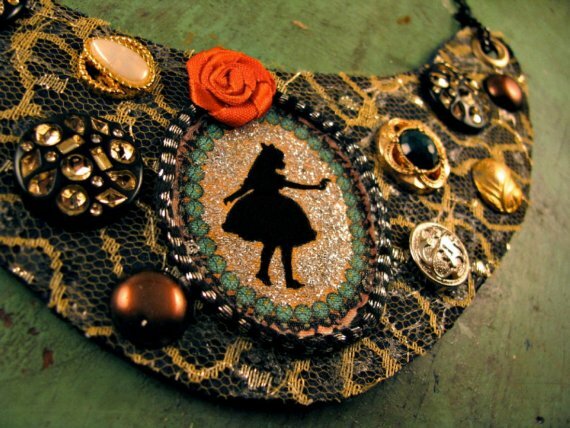 The bib-style necklace has been handmade by Yasmin and features an illustrated image of the fairytale character surrounded by tiny applique clocks – magical! 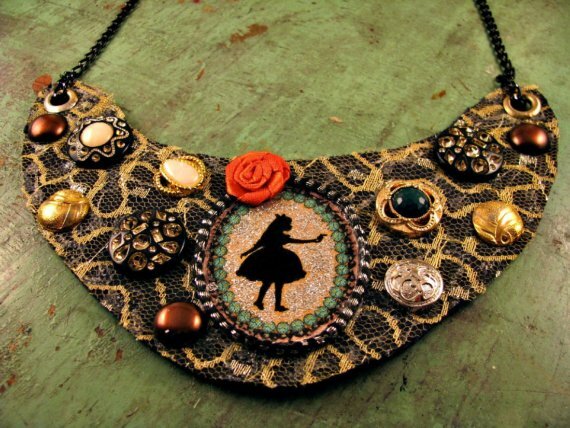 Grab this piece fast as time is ticking away! Mixing the past with the present has worked wonders for the brilliant Bochi collection on Etsy. 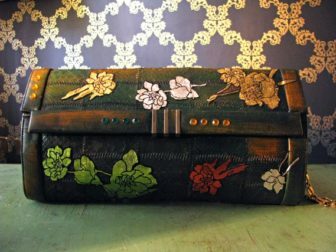 You can purchase or shop more from the range online, click here to find more restyled bags, up-cycled fashion and handmade jewellery: “It’s fun and quirky with a touch of elegance,” says Yasmin, and I couldn’t agree more.